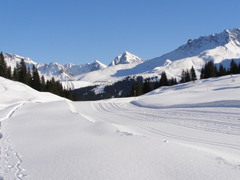 Always ready to experience a new adventure, the Adventure Kids try the art of snowshoeing in Arosa, Switzerland. 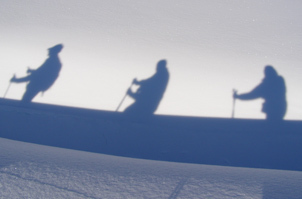 The origin of snowshoeing is believed to date back to around 4,000 - 6,000 years ago with its beginning in Central Asia. Although it was adopted by the United States and Canada, this was one sport that to be honest with you, really never had any appeal for us; that is until we tried it. First of all, there is the equipment, traditional snowshoes are made with hardwood frames and rawhide lacings, and they are large and somewhat cumbersome in order to distribute your weight over a large surface. Somehow trying to walk over snow with these very large appendages strapped to our feet really never captured our imagination. What exactly was the attraction? Okay, for hunters or forest rangers they could be an important means of getting from point A to point B, but why would anyone else want to do this? 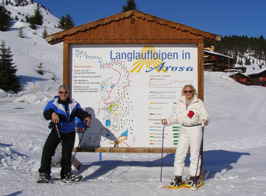 Curious and adventurous souls that we are, we decided that we were up for the challenge and signed up for snowshoeing lessons when we were in Arosa, Switzerland in late January 2008 to learn about this interesting sport. Dressed in ski clothing for our lesson, the driver from the Tschuggen Grand Hotel drove us to meet our instructor at the Langlaufschule Geeser. We walked the short distance to the steps of the shop and with the sun blazing down on us, realized that perhaps we had dressed in too many layers of clothing. Although Ernesto, our instructor wore traditional snowshoes, he equipped us with more modern snowshoes, titanium snowshoes (for Edward), plastic snowshoes (for Debra), and provided us with snowshoe poles, similar to ski poles, which would help us with our balance. Snowshoes are worn over regular shoes or hiking boots, and although (Debra's) Moon Boots were very fashionable, they would not be useful for snowshoeing, so he also provided a pair of hiking boots. Fully outfitted, we were now ready for our lesson to begin; namely putting on the snowshoes, and then maintaining an upright position while trying not to step on our snowshoes and fall down before we even began. Step one was to actually take a step, which felt rather awkward with these unfamiliar appendages attached to our feet, but somehow we managed to take a few steps without falling down, and thus Ernesto felt we were ready to start on our snowshoeing journey. Ernesto told us that the trick so to speak of walking with snowshoes is to learn to kind of shuffle your feet along and not lift your feet too far off the ground in order to conserve energy. So, walking with the grace of elephants wearing stilettos, we set off across the cross-country ski area being careful not to step on the ski tracks as we made our way to an area with pristine snow where we would begin our snowshoeing trek. Following in Ernesto's tracks, we learned to climb a slight incline as we leaned a little forward as we walked up the hill. We were rather amazed as we watched where we placed each foot and saw that we were actually walking across the top of the snow supported by the snowshoes. We kept watching our feet until Ernesto teased us that we already knew what our snowshoes looked like, that we now needed to look around us and enjoy the beauty of the trail. Snowshoeing is a great workout and when we stopped for a few minutes to catch our breathe, we looked around and saw the way the light filtered down through the amazingly tall pine trees, and how if we looked closely at the ground, we could see deer, rabbit, and fox tracks in the pristine snow as well as on old snowshoe tracks that the animals use to conserve their energy, which was an interesting concept of man actually helping nature. There was also something very exciting about walking over the pristine snow where no one had been and leaving our mark like explorers. We learned to not only to look where we were walking, but also to listen as well to the different textures and sounds of the snow from walking through fluffy, new powder, to snow that was soft and wet from the bright sun, to the crisp and crunchy snow in the shade of the trees, because when walking on high ground, one has to pay special attention to the sound of the snow and to be aware of possible avalanches that could occur. Stopping for a tea break along a high ridge, we were surrounded by the majestic mountains, and with the sun beating down on us, we realized how lucky we were that we had the opportunity to experience this little bit of heaven. Edward: Tea break over, we started walking again when suddenly I caught the tip of my snowshoe in the snow, fell to my knees, and promptly sunk in the snow up to my waist! Naturally, Debra starting laughing hysterically and snapping photographs before checking on my safety, as I tried to use my pole to push myself back up. However, no matter how I tried, the pole only sunk farther below the snow, and suddenly I realized how deep the snow actually was that we were walking over. While Debra managed to regain her composure, Ernesto with infinite calm and patience, told me to try to turn on my side, and then to push myself up, which I finally managed to do after a few misguided attempts. 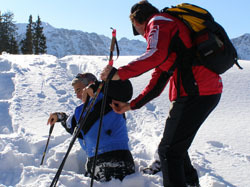 A valuable lesson that we learned is that when snowshoeing in an unfamiliar area, it is always best to go with a guide. We continued our snowshoe trek walking down valleys and up small hills while soaking up the beauty around us. By the time that we returned to our starting point, we had walked for 2 hours, had a great cardio vascular workout, and had covered more than 4 km (2.5 miles) of territory. What a fabulous accomplishment! No wonder people get hooked on snowshoeing. 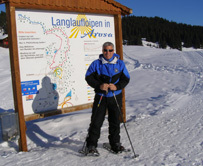 For information on Switzerland, please visit the website: www.MySwitzerland.com. 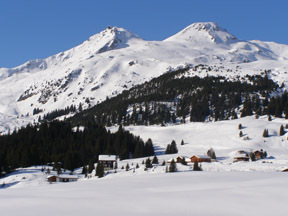 For information on Arosa, please visit the website: www.Arosa.ch.